We are among the acclaimed names in the industry, bringing forth Stock Racks for our priceless customers. 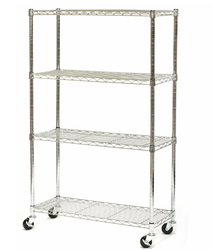 The offered racks are characterized by a flawless design and sturdy construction. 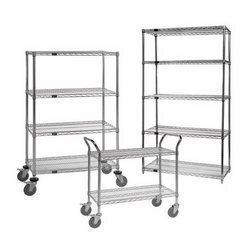 We are the leading manufacturers are of Stock Racks . These Racks are made out of the Best quality Steel, with Certifications, sourced form the top manufacturers in the Country. These Racks are Powder Coated with the top of the line Corrosive resistant Powder Coating – which is tested on all parameters. We offer elegant Foldable Racks with contemporary look to our esteemed clients. These are manufactured using latest technology machines and tools in our manufacturing unit. We follow ethical business policies in order to promote our business along with ultimate client satisfaction. Our quality inspectors are engaged in providing superior quality racks to our esteemed clients. Window Display Unit: MS Powder Coated window display adjustable unit of 7’ Height with 7 glass shelves of 10mm thickness of 12 x 4’ long. Banking on the skills of our qualified team of professionals, we are involved in providing a high-quality range of Stock Rack.